It was Friday and we had a lovely friend to feed, so I decided to make a fish pie. A hearty plate of comfort food. Peel and boil potatoes until very soft. Drain and mash with a little butter, milk, salt and pepper, then set to one side. Heat the oven to 200C / Gas Mark 6. Fry the leek in 50g of butter, then set aside in an oven proof dish, meanwhile boil the eggs. Poach the fish and prawns in the cream for about 10mins, I used a frying pan over a low heat. Add a splash of lime juice, thyme and seasoning. Turn halfway through to make sure it is fully cooked. Remove the fish and prawns and add to the dish with the leeks. Melt the butter with the flour in a pan and whisk. Use the cream you poached the fish in and the milk, add gradually a little at a time to the flour and butter, keep whisking so no lumps appear. Add nutmeg and seasoning, once thickened put to one side. Peel the eggs and chop them, add them to the leek and fish mix and stir carefully. Pour the creamy sauce over this mixture and stir again. Add the mashed potato topping and smooth the surface with a fork. Place in the oven for 40-50mins until the potato is golden. 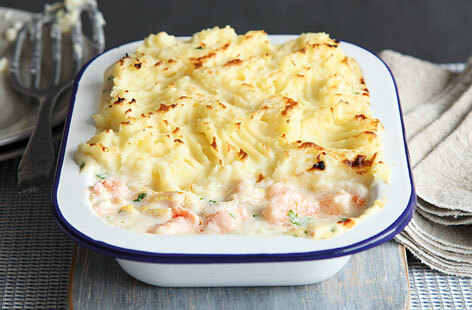 Gallery | This entry was posted in Recipes / Food and tagged Comfort Food, Fish, Fish Pie, Food, Friday Fish, Haddock, Luxury Fish Pie, Mash, Mashed Potato, Pie, Pollack, Potato, Prawns, Recipe, Salmon, Smoked Haddock. Bookmark the permalink.